BBAW 2012 Day 4: Pimp that book! One of the best parts about book blogging is the exposure to books and authors you might never have heard of before. Pimp the book you think needs more recognition on this day. Get creative! Maybe share snippets from other bloggers who have reviewed it or make some fun art to get your message across. Because of lack of time today, I will focus your attention on my most favorite French novel ever! It is quite famous in France, well, at least it WAS decades ago when I was in my teen and when all the students had to read it, but I still need to meet an American reader who knows about it or even about the author! I reread it in French this year, in fact it was my very first review of the year, but never dared to try it in English translation. Please click on the cover to read my review. Le Grand Meaulnes was published in French in 1912, and translated in English several times, I believe, usually under the title The Lost Estate. A search gave this result. As you can see, there’s an French translation even available as a Kindle book. I have not read enough of the online excerpt to certify that it’s a good translation. I highly recommend this book, which should definitely be better known in the US! This second volume presents 10 famous houses in literature, and the #10 is Les Sablonnières, the famous farmhouse of Le Grand Meaulnes. The author gives a very short biography of the author, and inserts excerpts of the book related to the house. 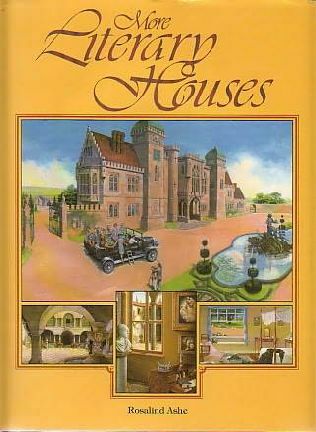 She has great illustrations, including maps of the house! – in Literary Houses: Dorian Gray’s house in Grosvenor Square ; the eerie chapel of Castle Dracula; Gatsby’s mansion at West Egg; aMiss Havisham’s house; Manderley! ; Northanger Abbey; Howard’s End, Thornfield Hall, the House of the Seven Gables, and Baserville Hall. – in More Literary Houses: Gone with the wind, Margaret Mitchell — The portrait of a lady, Henry James — Middlemarch, George Eliot — War and peace, Count Leo Tolstoy — Blandings castle, P.G. Wodehouse — The Castle, Franz Kafka — Buddenbrooks, Thomas Mann — The Leopard, Giuseppe di Lampedusa — Wide Sargasso sea, Jean Rhys — Le Grand Meaulnes, Alain-Fournier. Well, I actually managed to recommend 3 books! This entry was posted in BBAW, Historical novels and tagged Alain-Fournier, BBAW, French, Le Grand Meaulnes, Rosalind Ashe by WordsAndPeace. Bookmark the permalink. By “meet an American reader who knows about it,” do you mean “meet and shake hands” or “meet on the internet”? either. Have YOU read this book?? Yes, I have read it, and wrote three pieces on the book. We have actually been over this before – you have read them! I have met, in person, a fair number of Americans who have read Alain-Fournier, actually, but there is a big, big “but.” All but one are French teachers! So they actually support your point: “famous in France, bafflingly obscure in English-speaking countries.” It’s a wonderful book. The problem with the novel – I mean, the problem with recommending it widely – is its quiet strangeness. Hard-nosed realists will just be baffled. But that should still give us plenty of American readers, if they only knew. Of course Tom! I’m really sorry, i forgot you. So let’s say: 1 reader “in cyberspace”, 0 “in person”. And that’s why this day 4 is really good. I’m not familiar with the books you’ve recommended, but they sound like good fun|! Literary houses no less 🙂 I’d recommend two very different books: sci-fi Zoo City by Lauren Beukes for its harsh modernity and The Song of Everlasting Sorrow by Wang Anyi, the fictional life story of a woman who lived through the many changes in China from the 1920s onwards. Thanks, I may add the second one to my TBR. You didn’t do a post on your recommendations I see.